Al Cohen, the guy who thinks the idea of “a magic button which solves all problems” is “a slap in the face,” isn’t going to like this news. 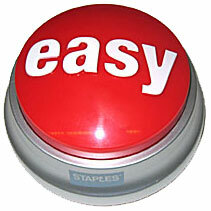 Staples says it has offloaded its 1 millionth “Easy” button, after selling them for less than a year. “Customers nationwide are finding increasingly creative and innovative uses for the Staples Easy Button, quickly elevating it from simple desk accessory to brand icon status,” says the press release. It goes on to list such uses. Our favorite: “A man from Tollesboro, Ky., received an Easy Button during a hospital stay for a heart transplant. Placed under his bed during surgery, the Staples Easy Button spontaneously went off, saying ‘That was easy.’” First of all, what is a Staples “Easy” button doing in an operating room? Second of all, if a guy has just received a new heart, it wouldn’t seem optimal to have unexpected loud noises going off under his bed. It’s lucky the man is alive. The release also points out that “the Canadian Prime Minister had his Easy Button on his desk during a national network news interview.” That one, like the button, speaks for itself.